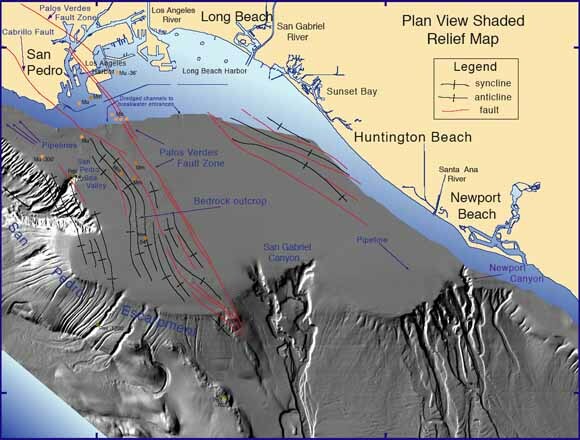 These maps show a) multibeam shaded relief and bathymetry of San Pedro Shelf Region, b) tracklines along which the data collected were used for interpretations, c) locations of faults and folds, especially Palos Verdes Fault Zone, based on that interpretation, d) isopach map of unconsolidated sediments, e) sediment thickness in paleo-valley and associated drainage basins. In addition to the maps, many examples are shown and lists provided of geophysical (seismic-reflection) data used for interpretations. The set consists of seven color sheets of maps and seismic-reflection profiles. Lat 33°28'N to 33°47'N, long 117°50'W to 118°20'W. Approximate scales as follows: Sheet 1 approx. 1:66,000; sheets 2, 3, 4&7 approx. 1:87,000; sheet 5 approx. 1:174,000; sheet 6 approx. 1:43,000. Sizes as follows: Sheets 1&3 are 48 by 36 inches; sheets 2, 4&5 are 36 by 48 inches; sheets 6&7 are 36 by 24 inches. We have also provided the same set of maps at half-size; these are more apt to be something a user could print on a large printer or medium-sized plotter.